Gallant has helped engineer turnarounds before; after a fifth-place finish in the Northeast Division in 2011-12, the Canadiens were 75-42-13 in Gallant's two seasons as an assistant coach, including their first 100-point season since 2007-08 and an appearance in the Eastern Conference Final in 2014. And although the Panthers missed the playoffs in Gallant's first season, they improved by 25 points. The Panthers have higher aspirations now. They reeled off 12 wins in a row before an overtime loss at the Vancouver Canucks on Monday. 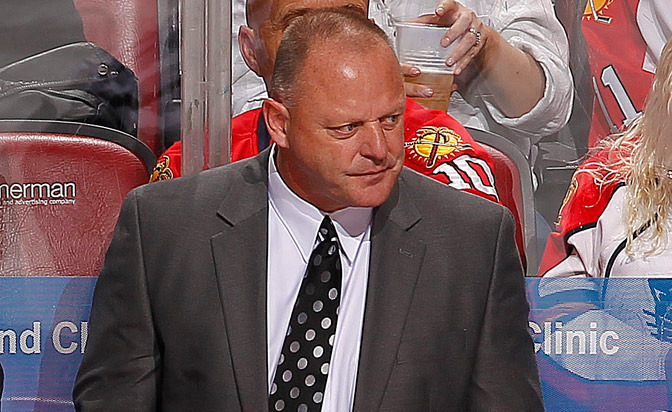 Players and coaches alike are growing and evolving as a group while pursuing their third playoff appearance since advancing to the Stanley Cup Final in 1996, and Gallant is enjoying the ride that has taken Florida to new heights. "We're not lucky to win anymore," Gallant said. "We're a good team, we know we're a good team. Everything is going well and people are noticing. People are talking about it. We're just having fun. We know it's going to end eventually, but we're enjoying it while it lasts." John Hynes, New Jersey Devils: At the midway point of last season, the Devils were 14-20-7 (35 points) and 10 points out of a playoff spot. Given little chance to contend this season after a 25th-place finish, New Jersey is in the thick of the Eastern Conference race while navigating injuries to forwards Mike Cammalleri (upper body), Patrik Elias (right knee), Jacob Josefson (left foot), Tuomo Ruutu (lower body) and Jiri Tlusty (upper body), and defenseman John Moore (lower body). At age 40, Hynes is the youngest coach in the League but came to the Devils with a winning pedigree. He won at least 40 games and made the Calder Cup Playoffs in each of his five seasons coaching Wilkes-Barre/Scranton in the American Hockey League. "The way he approaches every day is why he's successful, because he's very detailed in how we play with our structure," said Devils forward Bobby Farnham, who played for Hynes at Wilkes-Barre/Scranton. "He's very good expressing to us the identity we have to play with, and then tweaking certain things to each team that we play. He's always prepared. And he knows how to get the most out of the guys on his team." Barry Trotz, Washington Capitals: Trotz's impact on the Capitals was immediate when he led them from missing the postseason in 2013-14 to within one win from the Eastern Conference Final last season. This season, the Capitals are riding their best start to a season in terms of wins and points in their 41-year history. Washington has kept a commanding lead in the Metropolitan Division since taking over the top spot on Nov. 28 and is on pace to surpass their record of 121 points set in 2009-10 when it won the Presidents' Trophy. Playing without defensemen John Carlson (lower body) and Brooks Orpik (lower body), and forward Jay Beagle (upper body), the Capitals have proven resilient. They're 20-2-2 in their past 24 games and capped a five-game road trip with a dramatic 4-3 overtime victory against the New York Rangers on Saturday before a 7-1 win against the Ottawa Senators on Sunday. "The guys aren't satisfied," Trotz told Monumental Network. "We don't count wins. We just make sure we're ready to play the next team. That's a good way to look at it. It's leadership, it's the group that has pride about playing every night and being professional in this business. It's hard to be up every night and taking on everybody's best, but I think that makes us stronger. It makes us more prepared and we're still learning."